A GENTLEMAN IN MOSCOW tells the story of a Russian aristocrat living under house arrest in a luxury hotel for more than thirty years. What was the origin of the idea? Over the two decades that I was in the investment business, I travelled a good deal for my firm. Every year, I would spend weeks at a time in the hotels of distant cities meeting with clients and prospects. In 2009, while arriving at my hotel in Geneva (for the eighth year in a row), I recognized some of the people lingering in the lobby from the year before. It was as if they had never left. Upstairs in my room, I began playing with the idea of a novel in which a man is stuck in a grand hotel. Thinking that he should be there by force, rather than by choice, my mind immediately leapt to Russia—where house arrest has existed since the time of the Tsars. In the next few days, I sketched out most of the key events of A Gentleman in Moscow; over the next few years, I built a detailed outline; then in 2013, I retired from my day job and began writing the book. What is the nature of your fascination with Russia? I am hardly a Russologist. I don’t speak the language, I didn’t study the history in school, and I have only been to the country a few times. But in my twenties, I fell in love with the writers of Russia’s golden age: Gogol, Turgenev, Tolstoy, Dostoevsky. Later, I discovered the wild, inventive, and self-assured writing styles of Russia’s early 20th century avant-garde including the poet Mayakovsky, the dancer Nijinsky, the painter Malevich, and the filmmaker Eisenstein. Going through those works, it began to seem like every accomplished artist in Russia had his own manifesto. The deeper I delved into the country’s idiosyncratic psychology, the more fascinated I became. Kazan Cathedral is a perfect symbol of Russia’s mystique for me during the Soviet era. Built in 1636 on Red Square to commemorate both the liberation of Moscow from interlopers and the beginning of the Romanov dynasty, Kazan was among Russia’s oldest and most revered cathedrals. In 1936, the Bolsheviks celebrated the 300th anniversary of its consecration by razing it to the ground. In part, they leveled the cathedral to clear Red Square for military parades, but also to punctuate the end of Christianity in Russia. But Peter Baranovsky, the architect who was directed to oversee the dismantling, secretly drafted detailed drawings of the cathedral and hid them away. More than fifty years later, when Communist rule came to its end, the Russians used Baranovsky’s drawings to rebuild the church stone for stone. I find every aspect of this history enthralling. The cathedral itself is a reminder of Russia’s heritage—ancient, proud, and devout. Through the holy landmark’s destruction we get a glimpse of how ruthless and unsentimental the Russian people can be. While through the construction of its exact replica, we see their almost quixotic belief that through careful restoration, the actions of the past can effectively be erased. But most importantly, at the heart of this history is a lone individual who at great personal risk carefully documented what he was destroying in the unlikely chance that it might some day be rebuilt. The Soviet era abounds with sweeping cultural changes and with stoic heroes who worked in isolation at odds with the momentum of history towards some brighter future. This is your second novel set in the first half of the 20th Century. Can you talk about your interest in the period? My interest in writing about the early twentieth century is neither a reflection of a love of history, nor a nostalgia for a bygone era. What has attracted me to the period is that it has a proximate distance to the present. It is near enough in time that it seems familiar to most readers, but far enough away that they have no firsthand knowledge of what actually happened. This provides me with the liberty to explore the narrow border between the unbelievably actual and the convincingly imagined. I generally like to mix glimpses of history with flights of fancy until the reader isn’t exactly sure of what’s real and what isn’t. In terms of A Gentleman in Moscow, for instance, the launch of the world’s first nuclear power plant in Russia in 1954 is an historical fact, but the assembly of Party leaders to observe the blacking-out of Moscow is an invention. Similarly, the little copper plates on the bottom of antiques designating them as property of the People are a fact, while the wine bottles stripped of their labels are a fiction. What sort of research did you do for the book? Rather than pursuing research driven projects, I like to write from areas of existing fascination. Even as young man, I was a fan of the 1920s and 1930s, eagerly reading the novels, watching the movies, and listening to the music of the era. I used this deep-seated familiarity as the foundation for inventing my version of 1938 New York in Rules of Civility. Similarly, I chose to write A Gentleman in Moscow because of my longstanding fascination with Russian literature, culture, and history. Most of the texture of the novel springs from the marriage of my imagination with that interest. For both novels, once I had finished the first draft, I did some applied research in order to fine tune details. Initially, I imagined that the central challenge posed by the book was that I was trapping myself, my hero, and my readers in a single building for thirty-two years. But my experience of writing the novel ended up being similar to that of the Count’s experience of house arrest: the hotel kept opening up in front of me to reveal more and more aspects of life. In the end, a much greater challenge sprang from the novel’s geometry. Essentially, A Gentleman in Moscow takes the shape of a diamond on its side. From the moment the Count passes through the hotel’s revolving doors, the narrative begins opening steadily outward. Over the next two hundred pages detailed descriptions accumulate of people, rooms, objects, memories, and minor events, many of which seem almost incidental. But then, as the book shifts into its second half, the narrative begins to narrow and all of the disparate elements from the first half converge. Bit characters, passing remarks, incidental objects come swirling together and play essential roles in bringing the narrative to its sharply pointed conclusion. When effective, a book like this can provide a lot of unexpected satisfactions to the reader. The problem is that the plethora of elements in the first half can bog readers down making them so frustrated or bored that they abandon the book. So, my challenge was to craft the story, the point of view, and the language in such a way that readers enjoy the first half and feel compelled to continue despite their uncertainty of where things are headed. Whether or not I succeeded in doing so is up to you. Does the book have a central theme? I certainly hope not. In crafting a novel, I do not have an essential message I am trying to communicate. Rather, I hope to create a work of art that, while being satisfyingly cohesive, contains such a richness of images, ideas, and personalities that it can prompt varied responses from reader to reader, and from reading to reading. In essence, I want to gather together a pile of brightly colored shards of glass. But rather than assemble these shards into a mosaic with a fixed image, I want to drop them into the bottom of a kaleidoscope where, thanks to a glint of sunlight and the interplay of mirrors, they render an intricate beauty which the reader can reconfigure by the slightest turn of the wrist. Can you describe your process? My process for writing A Gentleman in Moscow was very similar to my process for writing Rules of Civility. In both cases, I designed the book over a period of years—ultimately generating a outline which detailed the settings, events, and interactions of characters, as well as the evolution of personalities and themes chapter by chapter. Once I’m ready to start writing, my goal is to complete the first draft in a relatively short period of time. Thus I wrote the first draft of Rules of Civility in a year and the first draft of Gentleman in Moscow in eighteen months. While I’m working on my first draft I don’t share my work. But once I’ve completed that draft, I give it to my wife, my editor in New York, my editor in London, my agent, and four friends on the same day, asking that they give me feedback within three weeks. I then use their varied feedback to begin the revision process. For both books, I revised the initial draft three times from beginning to end over three years. While I work with a very detailed outline, when the writing is going well it provides me with plenty of surprises. I was in the middle of writing the bouillabaisse scene in A Gentleman in Moscow, for instance, when I discovered that Andrey was a juggler. I was in the middle of drafting Sofia’s fitting, when I discovered (alongside the Count) that Marina had designed a dressless dress. And I was in the midst of the second or third draft when I noticed for the first time that moment in Casablanca when Rick sets upright the toppled cocktail glass. Can you comment on the structure of the book? As you may have noted, the book has a somewhat unusual structure. From the day of the Count’s house arrest, the chapters advance by a doubling principal: one day after arrest, two days after, five days, ten days, three weeks, six weeks, three months, six months, one year, two years, four years, eight years, and sixteen years after arrest. At this midpoint, a halving principal is initiated with the narrative leaping to eight years until the Count’s escape, four years until, two years, one year, six months, three months, six weeks, three weeks, ten days, five days, two days, one day and finally, the turn of the revolving door. While odd, this accordion structure seems to suit the story well, as we get a very granular description of the early days of confinement; then we leap across time through eras defined by career, parenthood, and changes in the political landscape; and finally, we get a reversion to urgent granularity as we approach the denouement. As an aside, I think this is very true to life, in that we remember so many events of a single year in our early adulthood, but then suddenly remember an entire decade as a phase of our career or of our lives as parents. How do you think of A GENTLEMAN IN MOSCOW in relation to RULES OF CIVILITY? When I was deciding what to do after Rules, I picked A Gentleman from among a handful of projects I had been considering. In retrospect, I see that my choice was probably influenced by an unconscious desire for change, because the two novels are a study in contrasts. Where the former takes place over a single year, the latter spans thirty-two. Where the former roves across a city, the latter takes place in one building. Where the former is from the perspective of a young working class woman on the rise, the latter is from the perspective of an aging gentleman who has lost everything. And where the former is virtually free of children and parents, the latter is very much concerned with generational relationships. One last difference is that A Gentleman in Moscow is much longer than Rules of Civility; but it has the same cover price, so you get 50% more words for your money! Can you tell us a little about the Metropol Hotel? 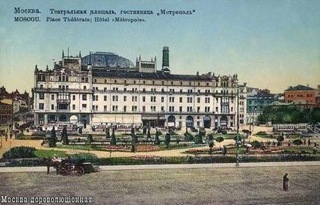 The Metropol is a real hotel which was built in the center of Moscow in 1905 and which is still welcoming guests today. Contrary to what you might expect, the hotel was a genuine oasis of liberty and luxury during the Soviet era despite being around the corner from the Kremlin and a few blocks from the head quarters of the secret police. Because the Metropol was one of the few fine hotels in Moscow at the time, almost anyone famous who visited the city either drank at, dined at, or slept at the Metropol. As a result, we have an array of firsthand accounts of life in the hotel from prominent Americans including John Steinbeck, e. e. cummings, and Lillian Hellman. You can survey these accounts and read a short history of the hotel at The Metropol section of this web site. 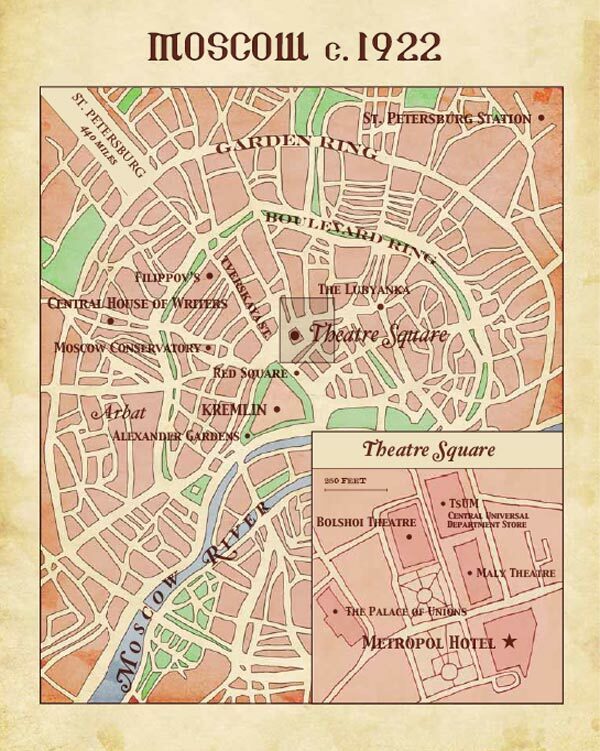 Map of Moscow 1922 from the book. Reproduced with kind permission from Alex Coulter. Are any of the characters in the novel based on real people? The thimble game that the Count plays with Sofia was from my childhood. My great grandmother was a Boston Brahmin who lived until she was a hundred in a stately house. When my cousins and I visited her (in our little blue blazers), she would welcome us into her sitting room. After the appropriate amount of polite conversation, she would inform us that she had hidden several thimbles in the room and that whoever found one would receive a dollar—prompting a good deal of scurrying about. When I was a boy of ten, I threw a bottle with a note into the Atlantic Ocean near summer’s end. When we got home a few weeks later there was a letter waiting for me on New York Times stationery. It turned out that my bottle had been found by Harrison Salisbury, a managing editor of the Times and the creator of its Op-Ed page. He and I ended up corresponding for many years, and I eventually met him on my first visit to New York when I was seventeen. It so happens that Salisbury was the Moscow bureau chief for the Times from 1949 to 1954. A few colorful details in A Gentleman in Moscow spring from his memoirs; he also makes a cameo late in the novel, and it is his fedora and trench coat that the Count steals to mask his escape. Finally, the scene in which the tempestuous Anna Urbanova refuses to pick up her clothes, throws them out the window into the street, and then sheepishly sneaks out in the middle of the night to retrieve them, was a scene that played out between my parents shortly after their marriage. Although, it was my mother who wouldn’t pick up her clothes, and my father who threw them out the window. I’ll leave it to you to guess who went out in the middle of the night to pick them back up. What’s with All the A-Words in the Chapter Titles? As you’ve probably noted, all of the book’s chapters are titled with words beginning in A. Why is that so? To be perfectly honest, I don’t have a good answer. Early in the drafting of the novel, I had the instinct that I should follow the rule, and I trusted that instinct. One reader has suggested that it was my own version of playing “Zut”; another has suggested it was a tribute to the first letters in the names Alexander and Amor; a third has suggested it was because the book is about new beginnings. All of these answers strike me as excellent! How Did the Count Finance his Time at the Metropol? Because of the poem Where Is It Now, the Count has friends in the upper ranks of the party (which is why he was sentenced to house arrest rather than prison). It was not uncommon in the Soviet era for the favored to receive housing from the state. Maxim Gorky, for instance, was given the mansion of Stepan Ryabushinsky, a former millionaire to live in (an Art Nouveau masterpiece worth visiting when you’re in Moscow). So, I think we can assume the Count’s attic quarters are provided gratis. Early in the novel, the Count uses his gold for additional expenses. The day he decides to stop using the gold is the very day he approaches Andrey to ask for a job as a waiter. On the book’s last page, an individual is sitting in a tavern. Some readers are unsure of who this individual is. All I can tell you is that the person sitting in that tavern is described by a specific adjective which has been used throughout the novel to describe a specific character. So, if you’ve read closely, you should know the answer yourself.